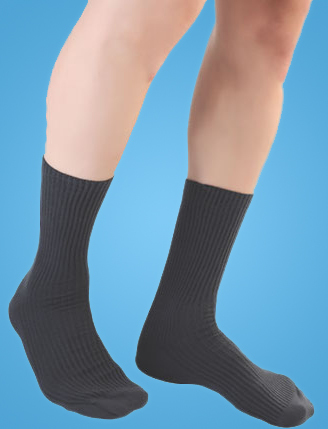 Diabetic socks are available in three colour, White, Blue, and Black. The women diabetic socks are available for use of any general feet size, these socks are used by male and female diabetic patients for comfort and support. Use during daytime. Remove before sleep. This is the best time to wash and dry it if you are using a single pair of socks only. Buying two pairs of socks is a great way to keep either one clean. Just wash the pair that you are not wearing daily. Use an antiseptic detergent to prevent any chance of infection from accumulated dirt on the socks. This is particularly important to remember because advanced diabetic patients also suffer from weakened immune syndrome making them particularly vulnerable to major infections from minor cuts and bruises. Wear it all the time especially when you are walking on very smooth floors. You can also wear it to the wet floor of the bathroom. Non- diabetic patients with a weak stance can use the product with great relief of additional support. Additional benefits include comfortable warmth in winter times. As the diabetic socks for men are available in three different colours, there are sufficient options to pair it with trousers, denims, and half pants. Aesthetic variations like these actually have a significant role in lifting the mood of the patient, which further motivates one to seek relief. Look up Diabetic socks for men and women at Reborn Healthcare UK. Diabetic socks are of a high qualitywith therapeutic benefits. Many people have benefited from these already, and you can do the same. Consider expressing your thoughts on using it in the customer review section of your preferred service.